The Dor Stop has always had notoriety from local diners due to this hometown restaurant’s menu and community involvement. Until Guy Fiery cast the national spotlight on them on Diners, Drive-ins and Dives, a show for foodies of all palettes. We’ve been to the Dor-Stop before for breakfast, but have yet to review it. This past weekend we specifically ventured into Dormont for breakfast the Dor-Stop. 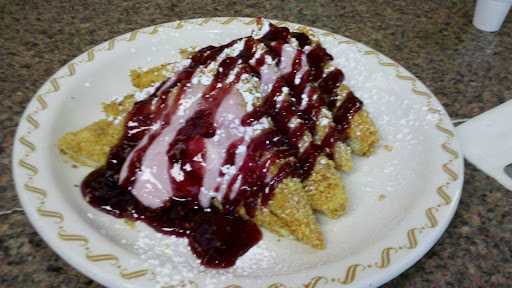 One of the trademark dishes is a raspberry french toast. A crispy french toast topped with powdered sugar and raspberry yogurt drizzled with raspberry sauce and served with breakfast meat of your choice. 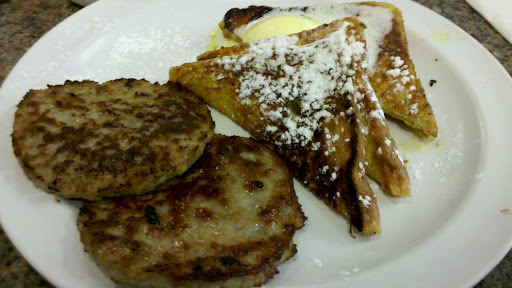 The french toast is dipped in corn flakes before cooked giving it a crispiness and results in a less soggy piece of bread. If you like a heavier, meatier breakfast, then try one of the great scrambles, including one they Guy himself added to the menu. Sure the Dor Stop may not be in prime visitor location, but it represents Pittsburgh to the fullest.